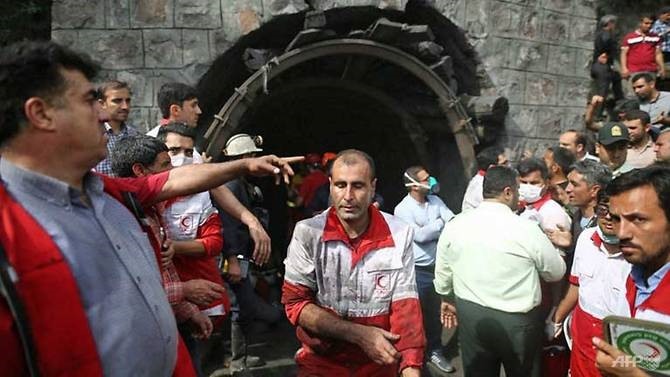 TEHRAN — Twenty-one coal miners have died attempting to rescue trapped workmates in northern Iran after an explosion on Wednesday caused a mile-long tunnel to partially collapse, news agencies said. Tragically, the bodies are those of miners who went into the tunnel to try to save 32 trapped workmates who are still missing, the agencies reported. The Zemestan Yort mine tunnel in Golestan province caved in when methane gas exploded underground as workers tried to jump-start a locomotive engine, according to initial reports. "Thirty-two miners have been trapped at the end of one of the shafts 1,300 metres deep into the mine," Golestan governor Hassan Sadeghlou said, quoted by state media. The rescue operation was going slowly as tunnels were filled with poisonous gases and miners were stuck at the far end of a 1,000-metre (yard) shaft in a mine that is around two kilometres (1.2 miles) long. Authorities were planning to dig a side tunnel to access the stranded workers in the mine near Azadshahr, one official there said. Another official said the priority was to remove the monoxide gas concentrated in the tunnel, as there was still the risk of another explosion. The teams were hoping to speed up work as an air-pumping machine had arrived at the site. Some 30 miners were treated in various hospitals for gas poisoning and injuries, state news agency IRNA reported. There was no information on the condition of those trapped. The workers sent to hospital were among those who had rushed from outside to help the victims after the blast. Iran’s President Hassan Rouhani has sent Minister of Labour and Welfare Ali Rabii to the mine in order to oversee the rescue operations and treatment of victims, IRNA reported. First Vice President Eshaq Jahangiri expressed condolences to the families of the victims and tasked Minister of Mining and Industry Mohammad Reza Nematzadeh with investigating the cause of the accident. The issue is particularly sensitive two weeks ahead of a presidential vote when Rouhani hopes to win re-election. Conservative candidates have accused the government of failing to care for the poor.